I’ve added some photos of the diaconal retreat day reflection centres to Ted’s earlier post about the “Images of Diakonia” event held last Friday, where thirty-some people spent the day at CCS reflecting on diakonia in light of the Easter story. If anyone wants to play along at home, here is the worship booklet that participants were given. 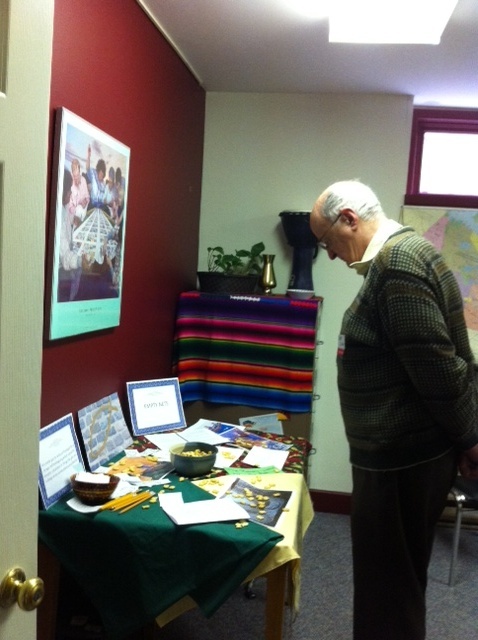 Our Retreat Day and OPEN HOUSE on Friday the 13th was a wonderful success with more than 30 guests participating. Among them were Don Phillips, Bishop of the diocese of Rupert’s Land, Rev. Bev Simpson, President of Manitoba North Western Ontario Conference, Michele Barr, a Diaconal Minister from the Evangelical Lutheran Church in Canada, and two visitors from the diocese of Keewatin. We also welcomed Bishop Elaine Sauer of Manitoba North Western Ontario Lutheran Synod to the Open House, as well as Paul Sodtke and Marion Jenkins, co-principals of the Henry Budd School in The Pas. 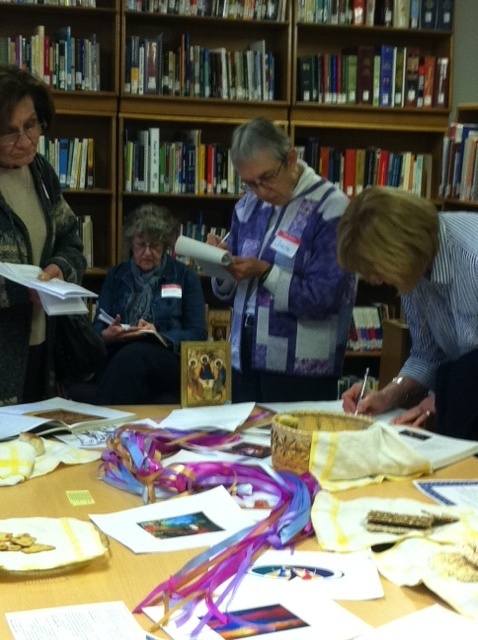 Helen Hunter, Irene Rainey, Penny Cummine at the "Road to Emmaus" station. Retreatants wandered from room to room and station to station – to reflect on the washing of feet and what “servanthood” might mean, on Simon of Cyrene accompanying Jesus on his way to the cross, on the empty nets and gifts of abundance that hide where we least expect them, on the road to Emmaus and how Christ appears to us in the stranger on the way, on rolling away the stone and how obstacles move with faith rather than muscle, and on the wedding at Cana, a resurrection story of transformation where diakonoi (deacons or diaconal ministers) are the ones who know the true source of the good wine. We may not repeat this event on the Friday after Easter every year, but who knows? Perhaps we’ll be back by popular demand!